Marinating is a great way to intensify the flavour of food with just a few basic ingredients. So, choose your favourite flavours and soak up the easy-to-follow tips in this guide. The purpose of marinating is to add flavour and, in some cases, tenderise meat, chicken and fish. Marinades can even be used on some vegies, including eggplant, zucchini and artichoke. In this guide you'll discover the key to successful marinating. Part of the trick is to plan ahead so your food has time to absorb the flavours. A marinade can be a paste, a liquid or a dry rub (such as a simple herb and spice mix). You can also mix and match flavours to create your own blends. For expert marinating, have the following utensils on hand. A juicer for squeezing citrus fruit. Tongs for turning the ingredients. Bamboo skewers for threading pieces of food together for cooking (soak skewers in water before using them so they don't burn). A pastry brush to brush the marinade over your food while it is cooking. Shallow dishes for marinating the food in. These ensure an even coverage of your ingredients. If the food isn't completely covered in marinade, turn it every 30 minutes. Use glass or ceramic dishes if your marinade contains citrus juice, vinegar or garlic. The acid in these ingredients may react with a metal container and taint the food. Marinades vary from recipe to recipe but they generally contain three basic components - oils, acids and seasonings. The oil content in a marinade locks in the natural flavour of the food and prevents it drying out. Some oils can also add flavour. 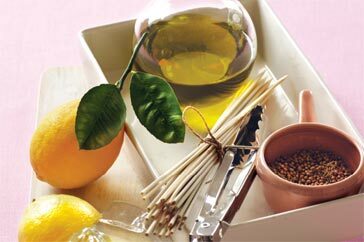 Good oils for marinating include extra virgin olive oil, sesame, peanut and infused oils (such as chilli). These ingredients tenderise meat by unravelling its proteins - this softens the surface and allows flavours to be absorbed. Acids include vinegar, wine, sherry, citrus juice, yoghurt and buttermilk. Yoghurt and buttermilk tend to keep foods moist, while a citrus-based marinade can "cook" raw fish. These provide the unique flavours. Garlic, ginger and onion are great starting points but you can also use fresh herbs and chilli to spice things up, or honey and sugar to sweeten your food. Seasonings include citrus peel, soy sauce, mustard, salt and pepper, and herbs and spices. As a general rule, the longer food is left to marinate, the more flavoursome it will become. However, the ideal marinating time usually depends on what you're marinating, the size of the ingredients and the type of marinade you are using. For best results, follow these general guidelines and see our chart below. Small or tender cuts, such as lamb and beef fillets, chicken breasts and seafood, require shorter marinating times (usually two to four hours). Larger or tougher cuts such as leg, rump or shoulder will need longer (usually four to six hours). Be careful when using acidic marinades. Foods left too long in these blends can change colour and texture. Fish fillets, for example, can change in a matter of minutes. Not all marinades need to contain liquid ingredients - some consist of only dry ingredients, such as herbs and spices. These mixtures are often referred to as "rubs" (because they are literally rubbed onto the surface of your food). Once the rub is applied to your meat, chicken or fish, cover the dish with plastic wrap and place in the fridge to marinate. Marinades used for raw meat or poultry can be used to baste ingredients as they cook, or for a sauce, but they need be boiled first. Place the marinade in a saucepan over high heat and boil for 5 minutes. This will kill any harmful bacteria. Marinate meat, chicken and fish in the fridge to prevent the growth of harmful bacteria.